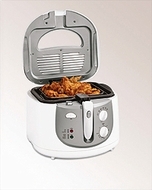 Fry foods quickly with the Hamilton Beach cool touch fryer. The frying basket is covered with a lid for splatter proof cooking. The cooking reservoir easily removes when cool for easy cleaning.